16 A little while, and you will no longer see Me; and again a little while, and you will see Me." 17 Some of His disciples then said to one another, "What is this thing He is telling us, 'A little while, and you will not see Me; and again a little while, and you will see Me'; and, 'because I go to the Father'?" 18 So they were saying, "What is this that He says, 'A little while'? We do not know what He is talking about." 19 Jesus knew that they wished to question Him, and He said to them, "Are you deliberating together about this, that I said, 'A little while, and you will not see Me, and again a little while, and you will see Me'? 20 "Truly, truly, I say to you, that you will weep and lament, but the world will rejoice; you will grieve, but your grief will be turned into joy. 21 "Whenever a woman is in labor she has pain, because her hour has come; but when she gives birth to the child, she no longer remembers the anguish because of the joy that a child has been born into the world. 22 "Therefore you too have grief now; but I will see you again, and your heart will rejoice, and no one will take your joy away from you. Who in fact is Jesus really? This was the theme among the people in Israel when Jesus walked on earth (Mat. 16:13-14). It has been this theme throughout the history and still is today. And why is it a theme in Norway today? Why at all is this a question? We can fully blame it on people’s disbelief - now as before. This because the whole testimony of the Scripture talks about this one thing – to preach and to reveal who Jesus is. The scripture testifies about Him, some places dim and mysterious. Read for example Genesis 1:1: “In the beginning God created etc.” – This we cannot see clearly before we read the Lord’s word in our Bible’s penultimate chapter, where He says: “I am the Alpha and the Omega, the beginning and the end.” (Rev. 21:6). In other places of the scripture it speaks simple and clearly. Like the Christmas gospel, where numerous people, year after year listens and listens to it, and still do not hear: “He is Christ the Lord.” (Luk. 2:11). In this passage Jesus also says who He is: “A little while, and you will no longer see Me; and again a little while, and you will see Me.” (v.16). After a statement like this - do you not want to ask: Who is this one, who predicts his own resurrection from the dead? “Who can do that?” Well, we can do it too, but only by the faith in Him. He said it on His own behalf. And by doing this He also tells us who He is. 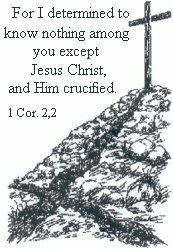 Jesus knew why He was in the world; He knew the race that was set before Him, until the other side of death and burial. It was resolved in God’s council, where He was the other person in deity! One with the Father and the Spirit. It was never any doubt, never any risk – He who made the way for us, He is God! This way – our salvation way – was resolved in God’s eternal council, in other words, by God, and then made way and completed by God. Not as much as a human finger has added even a small dust to this way. Our salvation way is God’s way alone. Therefore the book of Isaiah talks about this way: “A highway will be there, a roadway, And it will be called the Highway of Holiness The unclean will not travel on it, But it will be for him who walks that way, And fools will not wander on it. No lion will be there, Nor will any vicious beast go up on it; These will not be found there But the redeemed will walk there.” (Is. 35:8-9). This perfect way, is Jesus! (John 14:6). Read this with your eyes fixed on: – Cleared! -When you look at most of what calls itself Christianity throughout time – and also today – you would think it is up to us to clear the way. But He cleared it, and He did it all the way. (Heb.10:20). Further – a holy way. Yes, who is holy if not God? Three times holy! But when you see that this way, also has the description holy in the scripture - not even you who only have had a little glimpse of it, should fear to proclaim it. Preach the gospel! Further we read that no unclean walks on it. No, those who are in Christ are clean. You who feel your uncleanliness, just receive this! And you might even think: I cannot possibly be on this way; so unclean I am! This is the solution: You are in the Way – one with the Way, and in this you are pure! Hidden in Christ, cleansed by His blood. Not even the fool will go astray (Is. 35:8c (Norw. transl)) – not because the road is so “simple” as it is often said – (It is a folly for all intelligence) – but because everyone who walks on it, does it because of the Lord’s revelation. It is a gift of God that your heart is aimed on Jesus. We believe with our heart, not our mind, and you can not rule over the heart. Therefore you have to let everything that concerns your salvation be in God’s hands. That is the faith! Just look at our passage, how the disciples are when they with their mind try to understand what Jesus has said, and then typically turn to each other first. (v.17a). The result is this: “What is He saying: 'A little while'? We do not know what He is talking about.” (v.18). Then Jesus interferes. – But He is not saying: “Listen and I will explain this closer for you,” like you would do in a bible school. He does it even more dim and mysterious for them. But – this is the most substantial – He promises that this would all end in their hearts happiness! In other words: Trust Me! Notice also here that He does not explain every step forward in detail to the disciples, but draws their attention towards His person. You can read the same about the holy ones in the Old Testament – their way in this world seemed very strange. Often it also was like this in reality, but they had their hearts aimed at the promise that was preached to them. They were not explained how everything would happen along the way, but were told how it would be for those who stayed close to Him. Likewise with us. – Jesus says: “I am with you always, even to the end of the age.”(Mat. 28:20). On this cleared way, where lions and predators (the devil and his spiritual army) is without power, yes, completely locked out (John 14:30), there His people – the redeemed - will walk, we read. Since the kingdom of God and the kingdom of this world are completely opposite, so is God’s way and the worlds way. Your natural common sense and intellect is only interested in people’s business. (Mat.16:23), and can’t walk or find the correct way when it comes to spiritual things. Just look at what He tells the disciples here. How could their own common sense understand that their sorrow would be their greatest happiness? What kind of “healthy” common sense is this? Incomprehensible! The world will always think that if you want happiness, you must avoid any sorrow and effort. But God is not like He lets His own stay in the darkness, and if we did not believe so little, it would not often be so dim for us. Jesus gives them some great light here, but it wasn’t a great light for them until later. This because of their little knowledge for God’s ways, and they were also more concerned about understanding it all, than to hold on to Jesus promises. But His promise was never the less a lamp for their foot and a light on their path. – It kept their eyes aimed on Him no matter what. – Jesus has told us something! – We don’t understand it, but the promise was clear – we should be joyful. And He would make it happen. What brought them sorrow was that Jesus, their hope and joy, should be taken away. Just as the promised son Isaac was taken away from Abraham by the demand of sacrificing him. But also then it ended in joy and a mighty testimony for Abraham, about the substitute. This one, their hope and joy, should now be taken away from them, and right before their eyes nailed to a cross, the cursed tree, right in the middle of the enemy’s mockery and jubilation! But what was later becoming their great joy? Exactly this! “The blood of the Lamb is the key to heaven.” You shall not use this to open heaven. It is the “key” Jesus has used to open heaven for you.